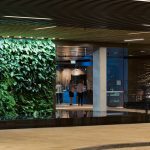 Make a statement on your next indoor design project with the world's most flexible and eco-smart vertical garden system. 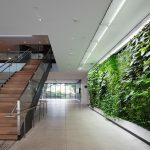 Considering a vertical garden for the interior of an office building, retail centre, hospitality venue, residential property or another small to medium-sized commercial project? 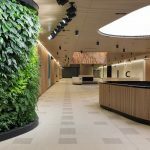 The experienced Vertikal team can provide all the supply, installation and maintenance services and advice you need to integrate a truly inspiring and sustainable vertical garden into your design. Selecting the right materials for the host wall and waterproofing accordingly. Installing a trough and drainage point to catch any excess water flowing through the system. Water flow is kept within the confines of the wall. Note: Water reticulation systems are problematic; they can increase water wastage, lead to insect breeding, take up valuable space and increase the risk of major water damage. we do not believe they offer a practical long term solution. Certain plants better suit different environments. Our horticulturalists can discuss and recommend stunning and practical plant palettes for an internal garden that receive no light, right through to sun drenched walls. Low light walls will usually require a UV lighting installation. We can help out with this too. 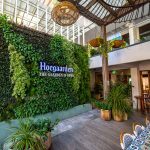 Need a vertical garden expert? 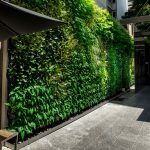 Contact us to discuss your internal vertical garden project.